Protect your table from stains with this simple and easy square coaster pattern, made in rows of half double crochet, it takes a small amount of yarn and can be worked up in no time at all, it’s great for the beginner crocheter. Make it in colors to compliment the decor of your room. Crochet a few to make a set. A perfect project to use up some of your left over yarn. Next Row – ch1, 1hdc in base of ch1, 1hdc in each hdc to end. Turn. Rpt last row until 9 rows have been worked in all from beginning. Fasten off. Finishing – Weave in any loose ends of yarn and trim off, attach a decorative button to one of the corners. Hope you enjoy making these square coasters, make them in a few different colors to complement the seasons, ie bright vibrant colors for Summer or browns and rusts for Autumn. Please can you pin this post for others to see with the link below. 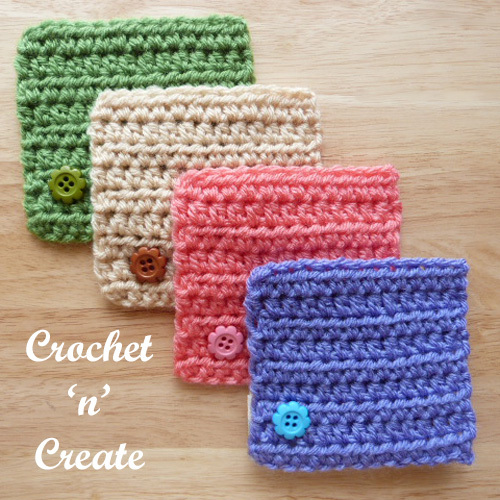 You are welcome to sell the finished products made from this free square coaster crochet pattern, I just ask that you put a link back to crochet ‘n’ create. This entry was posted in free crochet patterns, Home, Uncategorized and tagged crochet, crochet coaster, crochet for home, free crochet patterns on 30th March 2017 by crochetncreate.